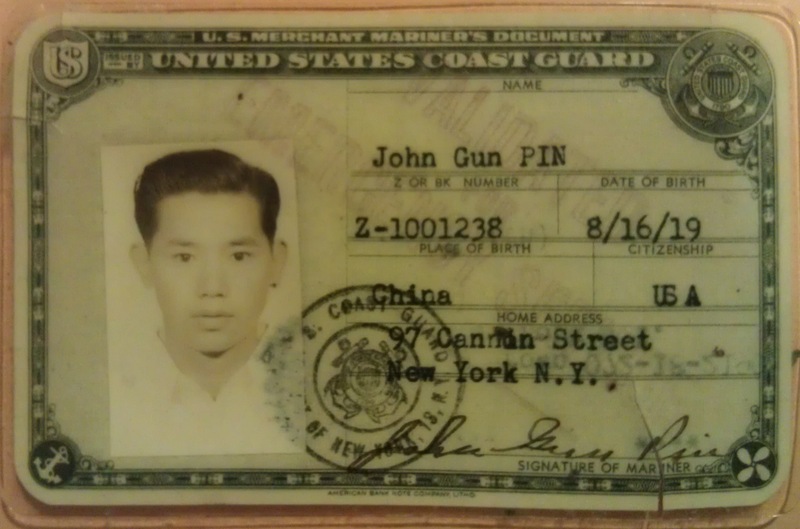 Former Marine mess cook John Gun Pin knew how to handle a cleaver. Harley Spiller (a.k.a. Inspector Collector) remembers his old friend, and the last dish he prepared: cured crab, or ha cha. Donghai to the core, Yeh Gum Pei had a diminutive physique and a distinctive personality. I was just a teen at a weenie roast when he yelled: “I ask for da fuggin’ mussid and you gimme da godamma kechuh.” Once I entered his kitchen in a tattered t-shirt?he severed its fringes with a colossal cleaver. When a dentist quoted a high price for extraction, Mr. Yeh tied his molar to a doorknob and slammed the tooth out. Our no-fuss hero was born on the island of Donghai in mainland China’s Zhoushan Archipelago. He cut his eye teeth on Ningbo-style eats, an important facet of zhejiang, or Shanghai food, one of the eight cuisines of the vast Chinese cookhouse. Ningbo cooking allows natural flavor to predominate and is characteristically salty and fragrant. Locals prize soft textured seafood dishes like braised eel or fried yellow croaker, and preserved snacks that help stretch the abundant white rice, like ni law, salted molting snails with shells as small and translucent as pinky nails. of ha cha, June 2012. John’s Jackson Heights home was for years the closest I got to China. Fish draped with newspaper dried on lines under the eaves; the kitchen was repurposed as cousin Coco’s acupuncture studio; and televised Chinese opera monopolized a visitor’s remaining senses. The basement, which opened onto a vegetable garden with fruit trees and a patio peppered with potted alliums, had been turned into an open kitchen. Aluminum-foil-wrapped appliances flanked a simple eating area, and jars of every description sat with their contents steeping, pickling, and curing in corners and on ledges selected for their particular qualities of temperature, light, and air. Eco-minded before their time, nothing in the Pins’ jam-packed fridge seemed to be in its original bottle. John died in January 1997. His son Michael and I visited Rose Pin, his widow, a month or so later. 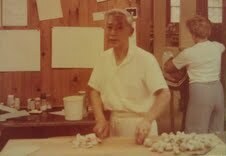 Her cooking was subtler and more precisely executed than her husband’s, but the first thing she offered was the very last dish John had made—a bottle of ha cha—salt-preserved crab. Rose served John’s amuse-gueule but declined to partake. “Too salty,” she said. John made two kinds of ha cha, always controlling the bottled admixtures for ullage. Both used the same ingredients, but one featured crab bodies, minced along with their shells. The other contained only claws, cracked but intact. Ha cha is best eaten by straining the chitinous bits through the teeth like a baleen whale filtering krill. Traditionally smeared over steamed white rice, the roseate Ningbo specialty has a squishy texture and, like John, a salty spiciness tempered with oceanic sweetness. Like much traditional Ningbo cuisine, John was simple but ingenious, with a powerfully unpretentious character. Today there are 7.5 million Ningbo natives, yet Shanghai and its Shaoxing-wine soused “drunken crabs” steal the limelight. There are few mentions of ha cha on the Internet and I have never heard of it being served in a restaurant. Other cured brachyura include the Korean chili-based yangnyeom gejang and soy-doused ganjang gejang, preparations so popular that the city of Gwangju boasts a “Street of Seasoned Raw Crab & Boiled Rice.” It seems that the only edible raw crab is the leg meat of zuwaigani (Hokkaido snow crab), which is turned into glistening sashimi. Eating more ordinary crab raw can cause serious infections from parasites like the ugly-sounding and acting lung fluke. Ha cha, ceviche, and other cured foods (think lox, ham) might appear raw to the uninitiated, but they are ready to eat. Cut the live crab in half. Remove the top shell. Discard the eyes, mouth parts, gills, and flipper legs. Scrub well. Using a heavy cleaver, chop the bodies into small fragments. Combine with the meat from either end of the top shell. Add approximately one teaspoon salt for each cup of minced crab, and leave for at least two days in the refrigerator. Before serving, a small amount of rice wine vinegar and sugar is added. You can also add hot chili spice. The cracked claws, and orangey-colored stuff (brains?) are similarly prepared. As you can see nothing is wasted. Just as Ningbo people treasure seafood, Cantonese old timers have a penchant for songbirds. Original dim sum parlors featured hooks where widowers hung their caged warblers, sipped tea, ate a delicacy or three, and pondered the ironies of agile minds trapped in ailing bodies. John Pin was no such sentimentalist—he salted crab because it tastes good. The author is grateful for the longtime friendship of John and Rose Pin’s children, Doreen, Kenneth, and Michael, whose assistance made writing this essay a great pleasure. Harley Spiller is otherwise known as Inspector Collector. He is an avid collector of items ranging from toothpicks to "mystery objects." He has exhibited some of his acquisitions with the Museum of Chinese in America, Cooper Hewitt, and the Queens Museum, and has written for The New York Times, Forklore and Canon Magazine. Spiller sometimes eats like he collects, thematically and in series, as when he made an eight-stop dumpling tour with a Morning News reporter in 2003. I saw the link posted on the Franklin Furnace artists’ email. This is a wonderful snapshot of Mr. Ningbo, Harley. I’m very glad to have read it because it’s a nice portrait, I can feel a bit of the man. Pretty salty, too. Friendship, food and culture – it doesn’t get better than this. what a wonderful tribute toa gentlecaring and devoted human being.